(TRR) – The inaugural KAABOO Texas Music and Arts Festival was announced on Wednesday. 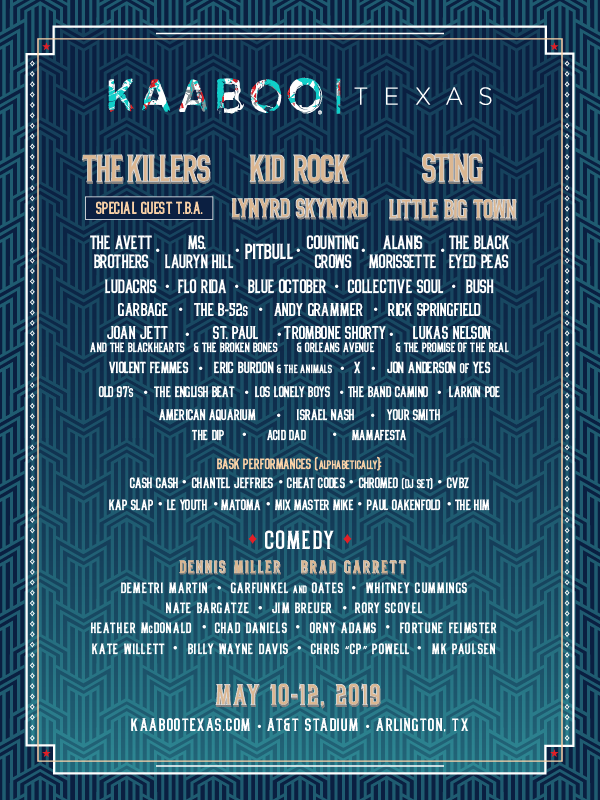 This May, The Killers, Kid Rock, and Sting will headline the first-ever installment of the KAABOO at AT&T Stadium in Dallas, TX. Ticket packages are on sale now HERE. The new festival features an eclectic lineup spanning many musical genres. The bill includes other rock and alternative like Counting Crows, Alanis Morissette, Blue October, Collective Soul, Bush, Garbage, The B-52s, Rick Springfield, Joan Jett and The Blackhearts, Violent Femmes, and more. Tagged festival, kaaboo 2019, kaaboo texas music and comedy festival, Kid Rock, sting, the killers.